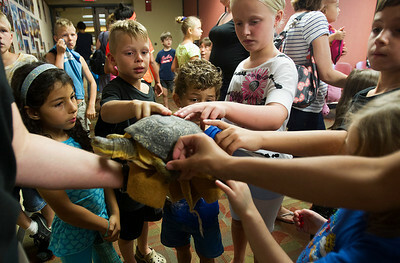 Kyle Grillot - kgrillot@shawmedia.com Cole Martin, 7, (top-left) and Rylan Martin, 5, pet Rae the Blanding's turtle during the Animals of McHenry County presentation at the Crystal Lake Public Library given by McHenry County Conservation District Wildlife Resource Specialist Beth Gunderson Tuesday, July 23, 2013. The presentation gives children and parents the opportunity to learn more of the history of animals in the region, covering issues of extinction and the current status of native animals, as well as meet this special visitor. Kyle Grillot - kgrillot@shawmedia.com Children pet Rae the Blanding's turtle during the Animals of McHenry County presentation at the Crystal Lake Public Library given by McHenry County Conservation District Wildlife Resource Specialist Beth Gunderson Tuesday, July 23, 2013. The presentation gives children and parents the opportunity to learn more of the history of animals in the region, covering issues of extinction and the current status of native animals, as well as meet this special visitor. 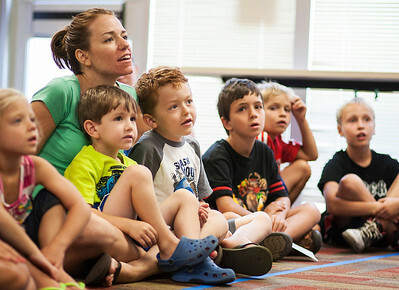 Kyle Grillot - kgrillot@shawmedia.com Autumn Martin (top-left) and her two sons Rylan Martin (bottom-left), 5, and Cole Martin, 7, listen during the Animals of McHenry County presentation at the Crystal Lake Public Library given by McHenry County Conservation District Wildlife Resource Specialist Beth Gunderson Tuesday, July 23, 2013. 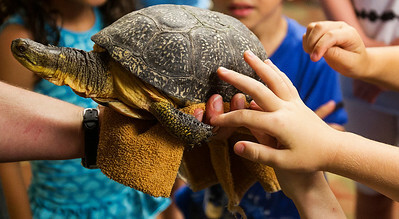 The presentation gives children and parents the opportunity to learn more of the history of animals in the region as well as meet a special visitor, Rae the Blanding's turtle. 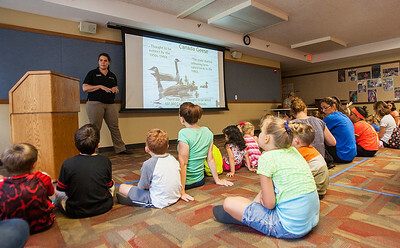 Kyle Grillot - kgrillot@shawmedia.com Children and parents watch during the Animals of McHenry County presentation at the Crystal Lake Public Library given by McHenry County Conservation District Wildlife Resource Specialist Beth Gunderson Tuesday, July 23, 2013. The presentation gives children and parents the opportunity to learn more of the history of animals in the region as well as meet a special visitor, Rae the Blanding's turtle. 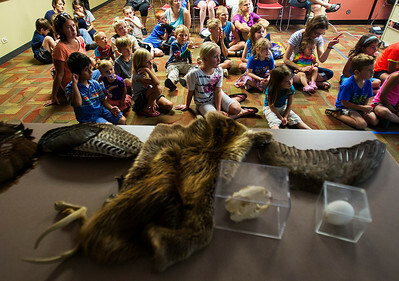 Kyle Grillot - kgrillot@shawmedia.com The remains of native animals are displayed on a table during the Animals of McHenry County presentation at the Crystal Lake Public Library given by McHenry County Conservation District Wildlife Resource Specialist Beth Gunderson Tuesday, July 23, 2013. The presentation gives children and parents the opportunity to learn more of the history of animals in the region as well as meet a special visitor, Rae the Blanding's turtle. 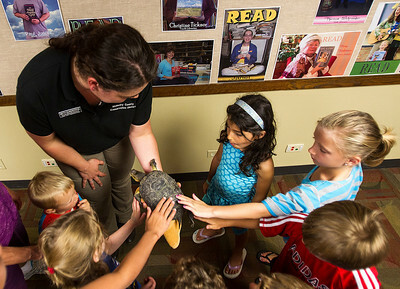 Kyle Grillot - kgrillot@shawmedia.com McHenry County Conservation District Wildlife Resource Specialist Beth Gunderson holds Rae the Blanding's turtle for children to pet during the Animals of McHenry County presentation at the Crystal Lake Public Library Tuesday, July 23, 2013. The presentation gives children and parents the opportunity to learn more of the history of animals in the region as well as meet this special visitor. 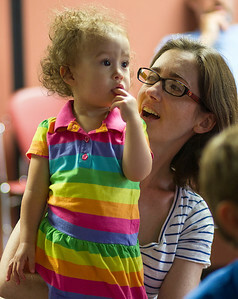 Kyle Grillot - kgrillot@shawmedia.com Sharon Snow holds her daughter Claire Snow, 1, during the Animals of McHenry County presentation at the Crystal Lake Public Library given by McHenry County Conservation District Wildlife Resource Specialist Beth Gunderson Tuesday, July 23, 2013. 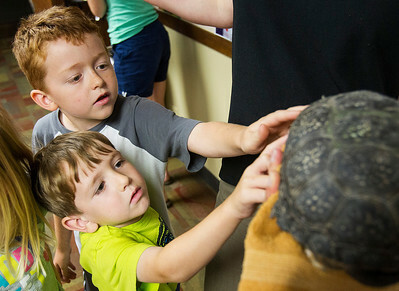 The presentation gives children and parents the opportunity to learn more of the history of animals in the region as well as meet a special visitor, Rae the Blanding's turtle.